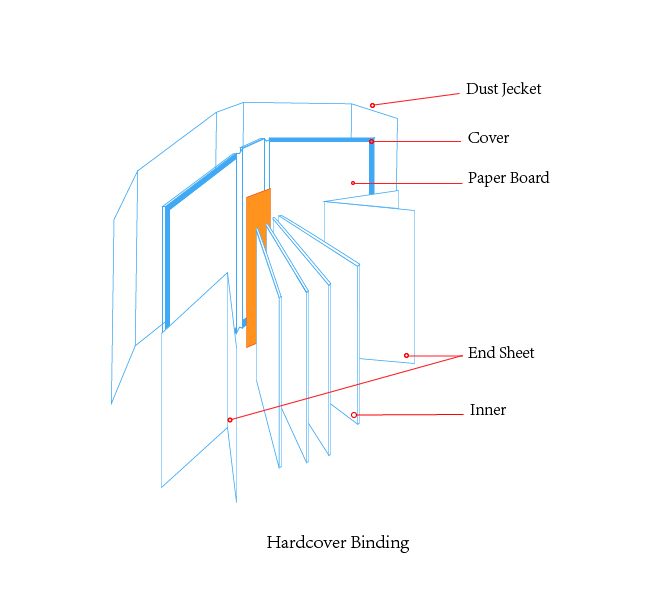 Hardcover binding is a kind of binding which interior pages are sewn bound plus end sheets and hard cover. The hard cover is a board wrapped printed paper, special paper, vinyl or cloth etc. The board thickness is 2mm, 2.5mm or 3mm. In common, the printed paper wrapped on the board is with gloss lamination or matte lamination. The end sheets are 140gsm offset paper, 157gsm art paper, 170gsm uncoated paper and any special paper etc. The hardcover binding includes square spine hardcover binding and round spine hardcover binding. Regularly, the interior minimum page count is 32 pages. Design book title, author name or publisher name on the spine is available. The hardcover book is stronger. It can be used for longer time. It stands on the book shelf looks high end. But hardcover binding is more expensive to compare with sewn and perfect binding. It also spends longer time on production. In common, it takes at least two weeks for production mass products. Because they are more processes and it takes time to dry. When you design the hardcover printing file, please keep more bleed for wrapping the board. We can provide free printing file templates for our customers.